Character: Once called Portland State IPA, then later Brutal Bitter Ale, now just Brutal IPA. Brewed with 2-Row, Carawheat, C15 & Rogue Farms Dare™ & Risk™ Malts, Rogue Farms Alluvial™ Hops, Free Range Coastal Water & Pacman Yeast. I have definitely been drinking Rogue Ales for quite some time now, and most likely starting out with their most popular beer by far down here in San Antonio, Dead Guy Ale. I know that beer was, and still is available at my old Metal stomping grounds. Rogue has come a log way, and mostly impressed me along the way. Here I am now finding myself staring at a bottle of Brutal IPA. Over the years this beer has changed names a few times, it seems. I see Brutal Bitter Ale, and I see that at one time the beer was called Portland State IPA. 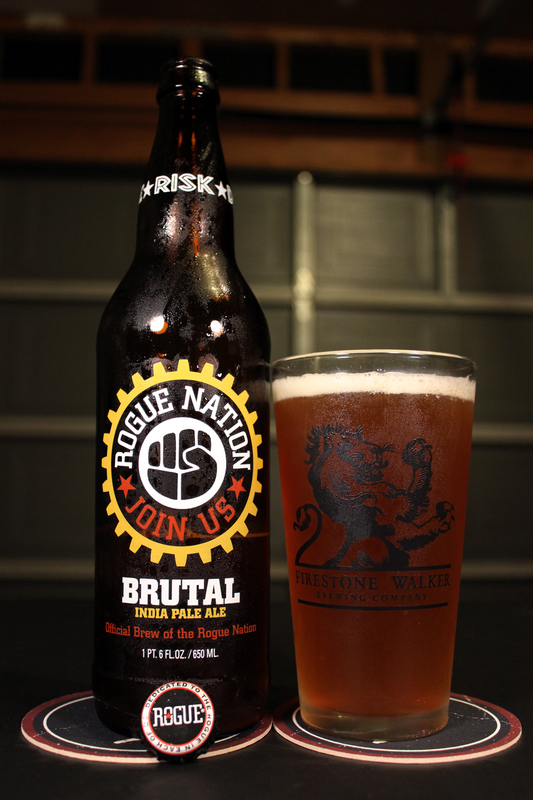 Rogue Brewmaster, John Maier describes this beer as a cross between a Very Extra Special Bitter (ESB) and an Indian Pale Pale. Brutal, a word that has been adopted by the Underground Metal scene to best describe a sub-genre of Metal, and a way to signify that a band is good. There was no way this beer was not going to make it onto the site. I mean come on, it says Brutal! It pours a nice looking burnt orange color, which cleared up as the beer warmed up sitting in a Firestone Walker Brewing Company logo pint glass. The beer was crowned with a half inch white frothy head, which held up nicely, leaving sticky web-like lacing down the pint glass throughout this drinking session. The aroma was typical of a good American IPA. Grassy and pine smelling hops were in the front line, followed by a body of malts, mostly caramel. There was a nice sweetness in the nose, which reminded me of brown sugar or molasses. There was a faint hint of fresh baked white bread. The finish and lingering aroma in the nose was a bit citrus-like; maybe some orange and lemon zest and grapefruit rind. The taste had the exact same characteristics of the aroma on this beer. The bitter hops of grass, floral, and pine hit the palate first. The bulk of the body is definitely malty, so rich in sweet caramel, brown sugar/molasses. The aftertaste is a good mix of things. At the end, I pick up on the flavor profile of fresh baked white bread, and citrus zest and rind. Imagine a bread loaf sprinkled with orange, and lemon zest, and candied grapefruit rind baked right into the bread. Mmmm! The body was not very heavy. The mouthfeel was crisp and chock full of bitterness. There is definitely a bite with this one. The finish is dry, which works well with the lingering flavor profile. I thoroughly enjoyed this beer, but was not blown to bits by it, as I expected it to be. When I see the word brutal in a name, I want that item to pummel me into a pile of meat. This beer delivered an above average beating, but not the brutal beat down I was looking for. This is still a very solid IPA, and definitely a strange one, being a cross breed of an ESB and an IPA. Metal Connection: So many different ways I could have gone with this one. I could have chosen Florida’s Brutality, maybe even New York’s Brutal Truth, or many other choices from the worldwide Metal community. What did I choose? I paired this beer, Brutal IPA with a band that bleeds brutality. A band who made a career on being one of the most brutal bands on the planet. I am talking about the east coast giants, Mortician. Mortician has been playing their style of Brutal Death Metal/Grindcore since 1989. They are one of the pioneers to our beloved Underground Metal Scene. I remember being blown away by their raw sheer power and brutality when I first heard their music. This would have been on the 1993 compilation release, Mortal Massacre. I had the privilege to witness these guys live, and even share the stage with them when I was in one of my bands. 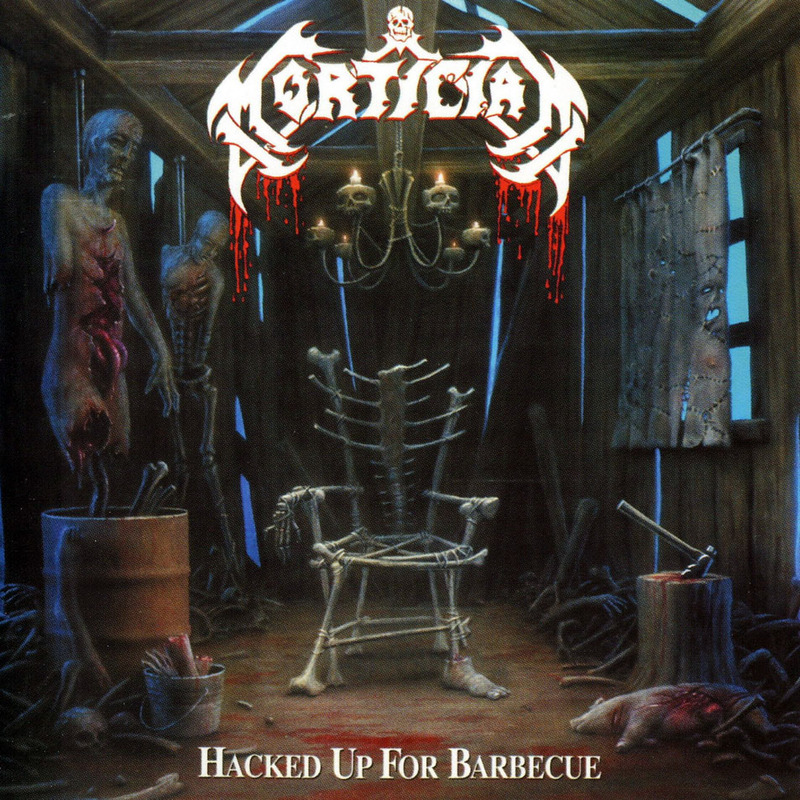 Here is the song “Brutal Disfigurement” from Mortician’s 1996 full length album, Hacked up for Barbeque, released on Relapse Records. Press play on the video, turn up your speakers, and prepare to be pulverized. Don’t walk away though, cause you might miss it. This song is very short, but still packs a death punch. I am Brandon’s Dad: 365brew.com As a result of seeing his link to your site now I am following your reviews as well. As I am sure you read on his site that I still believe that the National Beer of Texas is Shiner. However, after the Beerfest in Houston, I can be persuaded to at least taste other beers. I am fond of the Huff Brewing selections. You and Brandon keep up the good work. I know it is labor intensive!!!!! !